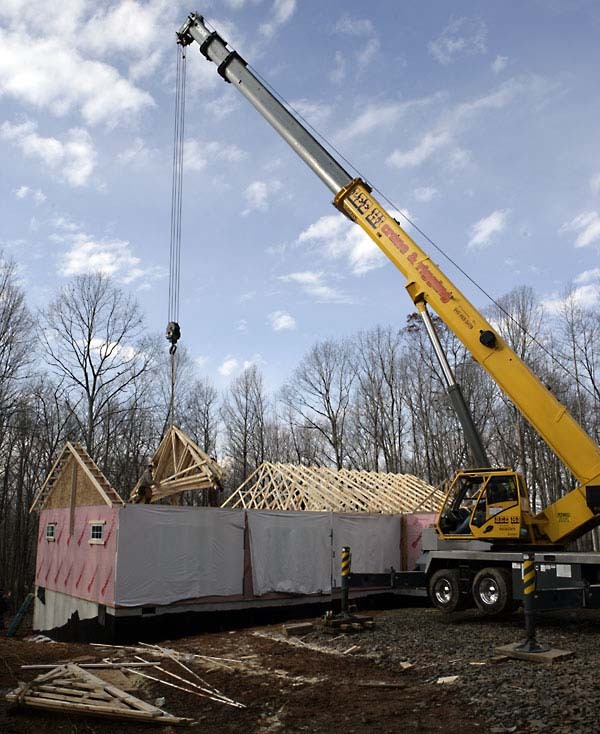 Seventy-one days after we placed the order for our new house with Southern Heritage Homes in Rocky Mount, VA, a large crane deposited the four modules on the waiting foundation…and we weren’t there to see it! The house installation crew broke for lunch and lifted the roof trusses into place in the afternoon. They hoped to begin sheathing the roof by the end of the day. I could not be there because I was running late on a project for a client in Charlottesville, so I called Doug Thompson, Floyd’s premier photojournalist, and asked if he could capture the event while the house still exhibits "modularity". He sent me so many pictures I will have to put them in a photo album. The three shown here seem to capture the moment. Thanks, Doug, for helping me out! You can see more pictures of the event on Doug’s weblog, Blue Ridge Muse. In a very few days, you will not be able to tell this house from its more conventional neighbors, except by examining passageways between rooms. Meanwhile, back in C’ville we are nearly going out of our minds trying to keep all of the balls in the air. The Smart vaults from SmartMove will arrive tomorrow morning and we will spend the next eleven days loading them. What fun…. The biggest problem is making sure that we leave out those things, tools. etc. which we need for the final clean-up projects. I am driving down to Floyd Saturday to put in a hearth for the wood stove. 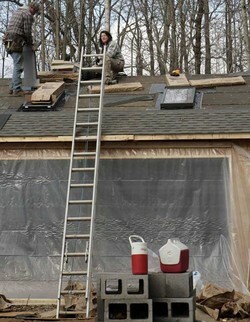 When that is done, I hope to work on paneling the workshop with the crew from Windy Hollow Construction. 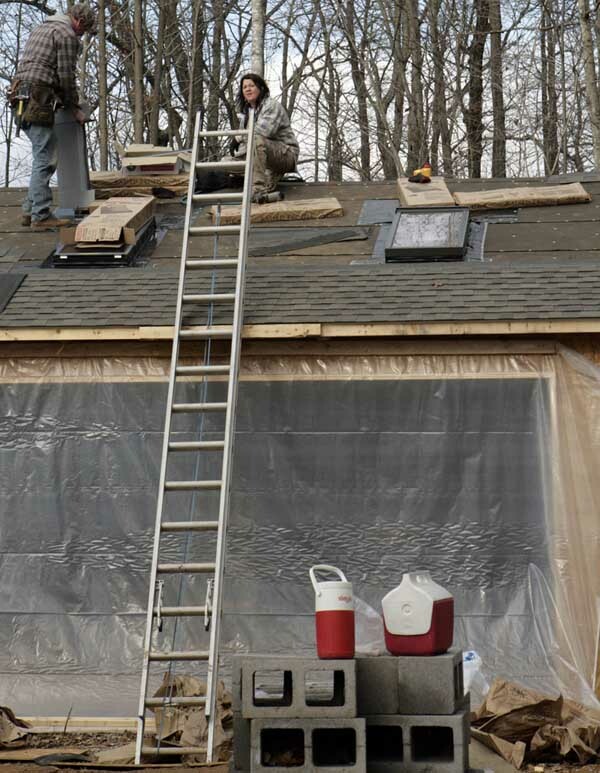 We have only three weeks to get the workshop habitable so we can live in it during the final frenzied weeks of finishing the house.You can see the skylights on the workshop roof. These make working in the shop much more pleasant than with artificial light alone. There is a device used by writers of fiction where each hard-won victory is immediately countered by a new threat that has to be overcome. This house saga is following that pattern. Now that we appear to be making progress on the house itself, the power company people tell me that there are no pad-mounted transformers because of hurricane Katrina! Current delivery estimates indicate that it will be four weeks before we will have power! We will have an old-fashioned Christmas this year! We will celebrate with candles! Our 8000 watt emergency generator will get a good workout. It should be able to provide enough power for basic services like well water, minimum lighting, cooking and heating, but I won’t be able to start using the shop for a while, unless I stick with hand tools. Hopefully, we will have telephone service and DSL, so we will be able to stay in touch with family and friends. Now you’ve got to the exciting bit haven’t you. It look sensational and BIG. I love the look of the back and can imagin that with a deck overlooking the run down the hill! 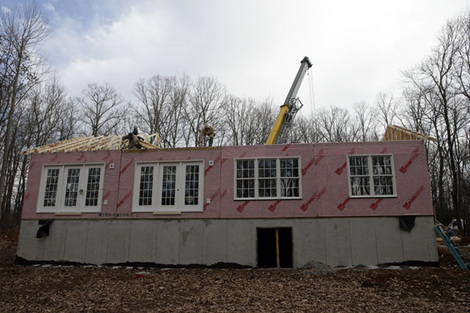 New houses are so exciting, partly becauase something has to go wrong somewhere along the line. But God they’re exhasuting as well. Just reading your blog of this process has made me tired at times. You must be knackered as they say in the classics! This is fantastic. I can feel the excitement. Looks great!